The fallout from Fairfax Media’s article last Friday, reporting on cases of Volkswagen’s suddenly losing power, continues to gather momentum. First, Volkswagen issued an official response after the original Fairfax article was flooded with comments from concerned owners. Since then Fairfax has continued to run stories about concerned Volkswagen owners and Volkswagen Australia has reportedly pulled all its advertising from Fairfax publications. On the one hand it is pleasing to see Fairfax has not been deterred by the loss of advertising revenue, while on the other it now just seems to be turning into a schoolyard spat with two parties trying to score points at any opportunity. For Volkswagen Australia, this is fast becoming a PR nightmare. 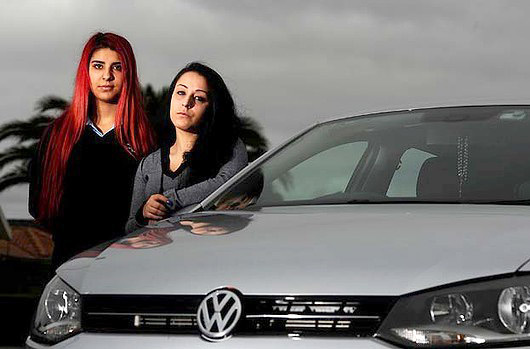 The latest article from Fairfax reports on the ownership experience of an 18-year-old Sydney woman, Senay Suleyman (pictured on the right with sister Seniz), who was gifted a new Polo for her 18th birthday last October. According to the article it has suffered a loss of power on four occasions and been returned to the dealer each time. The article says Volkswagen was considering replacing the car if the problems continued, but they now claim Suleyman’s Polo is fine. It’s important to remember that at the heart of the problem is an emerging group of dissatisfied owners who are sharing tales of worrying behaviour from what they should expect to be reliable and safe new vehicles. Whether some owners have been whipped up into a frenzy amidst the scrutiny from Fairfax is a separate issue, the point is Volkswagen Australia now has an image problem that it needs to sort out. And fast. UPDATE: We note Fairfax now has a dedicated sub-section of their Drive.com.au website for Volkswagen Problems. Unfortunately VW Australia has shown time and time again that they have no regard for anything like good customer service. There have been so many issues with dealerships that people have brought to the attention of management at VW and they simply don’t care. It’s time for VW to step up and do something about this. Sure, a recall will cost, but it will go a long way to restoring faith in the brand and halting what is sure to be a huge decline in sales over the coming months. I have to say it’s hard to feel sorry for VW when their dealerships are so arrogant, telling you how long the wait lists are etc, and then there is the delay with bribing out models like the scirocco etc. I personally don’t own a VW but have a close frie s with a golf which was delivered with an indicator not working and he’s having very clunky gear changes from his DSG. Not good for a $40k car.